Giro’s Pivot II Winter Glove features a waterproof soft shell upper with a breathable membrane that regulates moisture and air flow. Inside, the glove is lined AGrid anti-bacterial performance fleece for insulation and odor prevention. 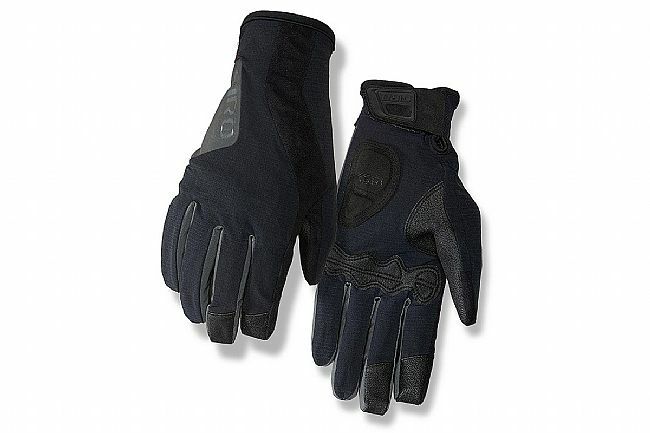 Gel padding disperses pressure to prevent hand fatigue. The palm, fingers, and padding feature Giro’s Super Fit engineering - a carefully tailored three-panel design that reduces bunching, enhances bar feel, and optimizes cushioning. Reflective detailing increases rider visibility in low light conditions. Temp. Range: 35 to 40°F (2 to 4°C). Waterproof & breathable outer membrane. AGrid anti-microbial thermal fleece liner. Gloves look great, but don't feel that soft on the inside. I tried multiple sizes but the seams seem to dig into my hands. In addition, the thumbs are too short. You only notice this when on the hoods of a road bike. Flat bar bikes it might not be an issue. The other issue is that I tend to shift using my middle finger and ring finger. There are no grippers on the ring fingers so they have the tendency to slip off when pushing pressing the shift levers. It is too bad they didn't work. Gloves look great, but don't feel that soft on the inside. I tried multiple sizes but the seams seem to dig into my hands. In addition, the thumbs are too short. You only notice this when on the hoods of a road bike. Flat bar bikes it might not be an issue. The other issue is that I tend to shift using my middle finger and ring finger. There are no grippers on the ring fingers so they have the tendency to slip off when pressing the shift levers. It is too bad they didn't work.